WP-1 has recently completed its final field campaign of 2010, which included collecting trips to sites in the south Moravia region of the Czech Republic and a survey of prospective sampling sites in western Slovakia. In Moravia, in collaboration with Petr Skrdla (Institute of Archaeology, Brno) and Petr Neruda (Anthropos Institute, Moravian Museum, Brno), RESET members Dustin White and Mark Lewis collected microtephra samples at the open-air 'Bohunician' sites of Ondratice I-Zelec and Bohunice-Brno 2002 and the open-air 'Szeletian' sites of Vedrovice V and Moravsky Krumlov IV. These Central European sites represent the northern extent of the current WP-1 sampling programme. (Fig. 1): Petr Skrdla at Ondratice I-Zelec. (Fig. 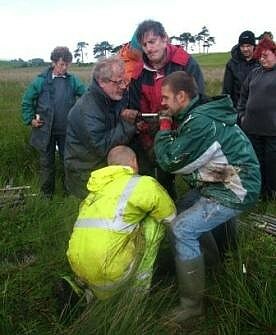 2): Dustin White and Mark Lewis sampling for cryptotephra at Bohunice-Brno 2002. (Fig. 3): Peter Neruda at Vedrovice V.
Next we traveled to western Slovakia to visit the early Upper Palaeolithic sites of Dzerava skala Cave, Certova Pec, Ivanovce, and Nove Mesto nad Vahom. 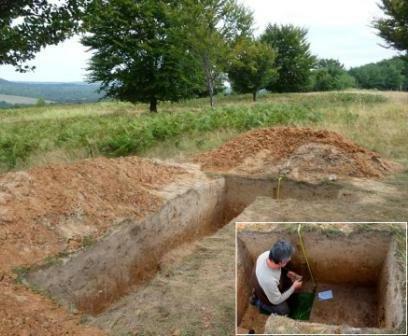 This brief survey, in collaboration with Lubomíra Kaminská (Institute of Archaeology, Slovak Academy of Sciences) and Ondrzej Žaár (Department of Archaeology, University of Nitra), enabled assessment of prospective sampling sites in this region for 2011. (Fig. 4): Interior of Dzerava skala Cave (Lesser Carpathians). (Fig. 5): Ondrzej Žaár at the open-air site of Ivanovce (Váh Valley). After the Salerno 2010 RESET meeting WP4 (proximal tephras) undertook fieldwork in Calabria, Sicily, Vulcano and Salina with Paul Albert (Continental-marine tephra matching) and Anna Todman (Recent activity of Vulcano). Co-supervisor Prof. Mauro Rosi (Pisa) was present along with Prof. Rosanna De Rosa and Paolo Donato (Cosenza) as specialists on Calabria and the Aeolian islands. 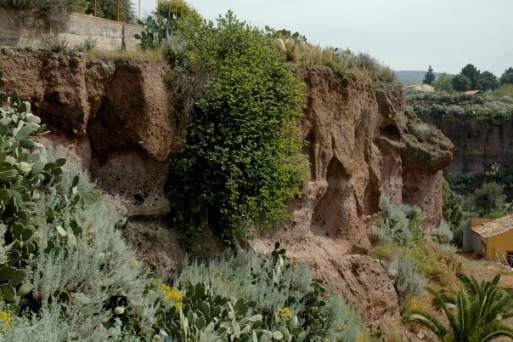 We spent a day on the Calabrian coast sampling sub-aerial reworked deposits believed to have orginated as fall deposits from major calderas in the southern Tyrrhenian Sea. Palinuro submarine seamount may have been responsible for major marker tephras in the Mediterranean, possibly Y3. We endured a Mediterranean storm en route to Sicily where we sampled pumice lapilli on the Milazzo peninsula believed to have come from explosive activity on the Aeolian Islands. 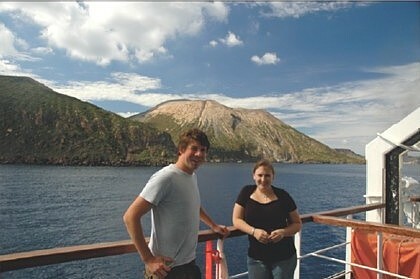 Three days of fieldwork on Vulcano and nearby Salina allowed Paul and Anna to undertake targeted sampling. In collaboration with Walpurga Antl-Weiser (Natural History Museum Vienna), Grub/Kranawetberg in Lower Austria has been sampled by WP-1 following the excavation of a deep sondage at the site in early September. The open-air site is well known for its Gravettian finds, including the recovery of two human tooth fragments, abundant stone tools and flakes, bone artefacts and jewellery, and rich faunal materials. Recent excavations have reached depths of over 2 m below the main cultural bearing horizon. Systematic samples for microtephra analysis were collected from this newly exposed, longer sedimentary sequence at the site. (Above left): 2010 excavation at Grub/Kranawetberg, Lower Austria. (Above right): Dustin White and Walpurga Antl-Weiser sampling at Grub/Kranawetberg. In late August WP-1 sampled the open-air sites of Tincova, Coşava II, and Romanesti - Dumbravita I in the Banat region of western Romania, in collaboration with Mircea Anghelinu (University of Târgovişte) and Ion Băltean (Arheologia, Romania), Victor Chabai (National Ukrainian Academy of Sciences), Valery Sitlivy (Belgium Royal Museums of Art and History), and Holger Kels (RWTH Aachen Universität, Germany). 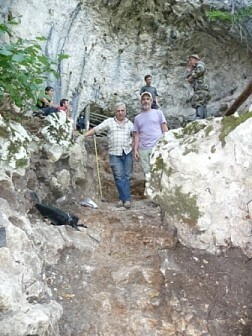 (Above left): Tincova, Romania (arrow indicates location of 2010 Trench II). Inset, Trench II tephra sampling column and location of OSL samples. (Above right): 2010 excavation trench at Coşava II, Romania. Inset, Trench 1-2 tephra sampling column. These early Upper Palaeolithic sites contain lithic assemblages attributed to so-called Proto-Aurignacian, Early Aurignacian, and Evolved Aurignacian industries, respectively. OSL and tephra sediment samples were collected from each of the site stratigraphic sequences as part of a collaborative study of the late Pleistocene history of central and eastern Europe. (Above): 2010 excavations at Romaneşti - Dumbraviţa I, Romania. WP-1 recently completed it's first sampling trip to the southern Caucasus region, including visits to Azokh Cave in Nagorno-Karabakh along the Armenia/Azerbaijan border (with Tania King, Yerevan Institute of Man and Patricio Domínguez-Alonso, University of Madrid), and Bondi and Undo caves in north-west Georgia (with Nika Tushabramishvili, National Museum of Georgia). 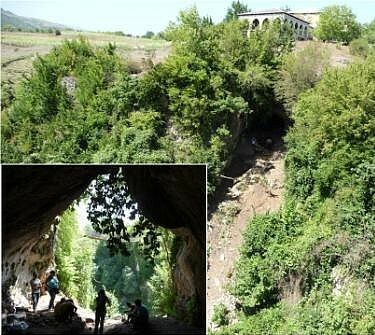 Azokh Cave is located within the Trans-Caucasian corridor in the southeast part of the Lesser Caucasus. The site complex consists of at least five caves, three of which contain rich palaeontological and archaeological remains. Mousterian artefacts dominate the assemblages recovered during recent excavations, along with more limited evidence of both Acheulian and Upper Palaeolithic occupations at the site. Sediment samples for microtephra analyses were systematically collected from exposed excavation profiles in Azokh Caves 1 and 5. Bondi and Undo caves are located near the town of Chiatura in the Imereti region of the southern Caucasus in north-west Georgia. Bondi Cave is situated along the Tabagrebi River with a southerly oriented entrance. The limestone cave is 11 m in length and 7 m in width, with sediments reaching depths greater than 4 m. Both faunal remains and lithics are abundant in the stratified cave sediments, including those with late Middle and early Upper Palaeolithic affinities. In addition, recent discoveries of twisted and painted flax fibres at the site indicate the handmade production of textiles during the early Upper Palaeolithic. 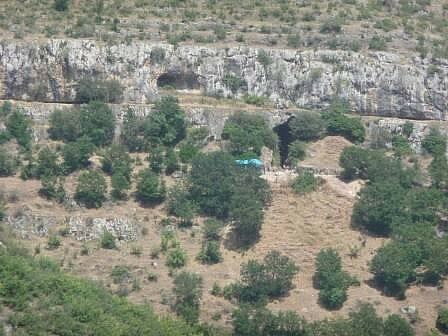 Nearby Undo Cave preserves very rich faunal remains at the front of the cave dominated by cave bear in association with Middle Palaeolithic stone tools. In addition, the existence of a 47 m deep karstic pit has been identified well within the cave system, preserving rich faunal and anthropological materials currently under study. 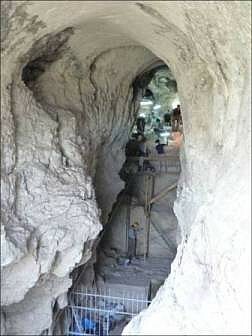 Accessible sections from both Bondi and Undo caves were systematically sampled for distal microtephra analyses. Western Poland is proving to be promising for Lateglacial tephra investigations and so WP-3 returned to the region to sample two organic sequences associated with archaeological sites with Shouldered Point (Hamburgian) and Federmesser lithics technocomplexes, and the archaeological contexts from where the lithics have come directly. The first site to be visited was Mirkowice, a Hamburgian site situated 65 km northeast of Poznań. Here a short (c.75 cm) organic profile was sampled together with the horizon from where the lithics have been recovered in two neighboring aeolian sand units. 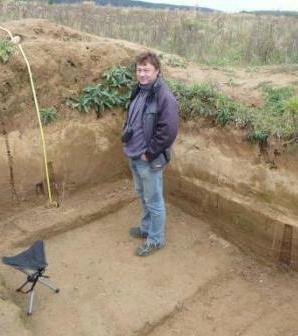 Our collaborator for this work was Jacek Kabaciński (Institute of Archaeology, P.A.N. Poznań). Next we moved to the Kopanica Valley in the middle part of the Oder Basin where, with a team led by Jan Michał Burdukiewicz and Adam Szynkiewicz (University of Wrocław), we sampled three archaeological localities (the Hamburgian sites of Olbrachcice 8 & Siedlnica 17A; the Federmesser site of Siedlnica 17) together with a c.4-5m peat, marl and gyttja-filled oxbow lake at Łęgoń, site 5. Finally with the same group of collaborators we visited a site a few km west of Krosno Odrzanskie, Strumienno, from where Late Palaeolithic lithics have been recovered. On July 20 Christine Lane gave a public lecture in the Headley Lecture Theatre of the Ashmolean Museum, Oxford, entitled Tephrochronology: An Explosive Way To Date The Palaeolithic. New evidence in the form of Late Upper Palaeolithic stone tools have recently been reported at Howburn Farm, near Biggar, Lanarkshire. The new finds suggest that Upper Palaeolithic people ventured north into what is now Scotland in the Lateglacial period. Discovered by the Biggar Archaeology Group (BAG), the site was investigated by excavation in 2009 and currently represents the earliest evidence for human habitation in Scotland. For an in depth discussion of the site and its discovery, see this article written by Tam Ward and Alan Saville in the journal Current Archaeology. Typologically and technologically the industry at Howburn shows broad similarity to the Hamburgian sites which WP-3 has sampled in north Germany. Since November 2009 work around the village of Elsrickle by Richard Tipping (University of Stirling) and members of BAG has shown that the floor of the valley below the Howburn archaeological site contains the sediments of not one, but two lakes. At one time during deglaciation a large pro-glacial lake filled the valley as far as the archeological site. This has been christened ‘Loch Howburn’. A second, much smaller lake survived the sudden drainage of ‘Loch Howburn’, as the ice-dam collapsed. This is preserved at the foot of the slope below Elsrickle, and has been called the Priest’s Well Basin. The new work by RESET will concentrate on cores taken on a visit to these two former lakes on July 17th in the hope that the sediments preserve microtephra. Discovery of such volcanic ash horizons will indirectly help the archaeological investigations by refining the dating of the cores and permitting better correlation with other Lateglacial environmental records. Between June 22nd and 24th WP-3 visited two Lateglacial archaeological sites in the Paris basin to take samples for microtephra analysis. The first site, Pincevent, is situated 65 km southeast of the city of Paris close to the river Seine. It is an extremely well known open-air archaeological site having been excavated over many decades from first being discovered in 1964. Excavations have revealed a considerable number of activity floors dating to the Magdalenian period of which level IV20 is the best known. The huge stone tool assemblage is complemented by faunal evidence and in-situ hearth features. 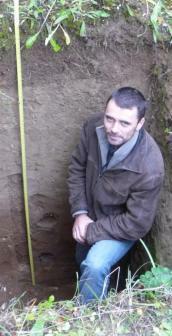 With assistance from the investigators, Pierre Bodu, Gregory Debout (Université de Paris I) and Michael Orliac the RESET team was able to sample the silty interstadial deposits associated with the Magdalenian industry (GI-1e and GI-1d), and the overlying more sandy deposits believed to have been laid down during the Allerød (GI-1c to GI-1a) and Younger Dryas (GS-1) periods. The second Paris basin site to be sampled by RESET, Étiolles, is 25 km from the city and, like Pincevent, is very close to the Seine. Étiolles is another open-air site of Magdalenian age with a rich stone tool industry and a more poorly preserved faunal assemblage. The site has been investigated archaeologically since the 1970s. Floor surfaces with hearth features and structured activity distributions are well known from the many years of excavation. 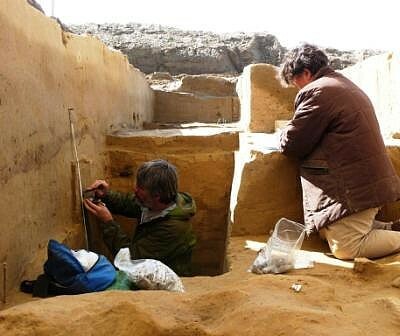 RESET was able to sample the Magdalenian and immediately overlying deposits in locus 2, being ably assisted in the process by the directors of the site, Monique Olive and Marianne Christensen (Université de Paris I). The slightly different taphonomy of the deposits should hopefully enhance the possibility of finding associated tephra should the Paris basin have experienced volcanic ash clouds in the time period covered by the depositional contexts. The Central Balkan region was the focus of WP-1's first field campaign of 2010, which included sampling trips to the caves of Golema Pesht in Macedonia (with colleagues Ljiljana Salamanov-Korobar and Igor Tolevski, Museum of Macedonia) and Tabula Traiana in Serbia (with Dušan Borić, University of Cardiff), and also a survey of prospective cave and open-air sites in western Romania (with Mircea Anghelinu, University of Târgovişte). Golema Pesht Cave is located in the Treska River valley (Poreche region) of central Macedonia, 65 km SW of Skopje. The cave is 31 m long and 18 m wide with a south-east facing entrance. Excavations at the site in 1999 and 2003-2004 revealed 19 geological layers reaching depths >3 m. Rich archaeological and faunal assemblages have been recovered from stratified late Middle and early Upper Palaeolithic contexts, and these levels were systematically sampled for distal microtephra analyses. (Above right): Golema Pesht Cave, Macedonia. Inset, interior excavation areas of the cave. Tabula Traiana Cave is situated in the karstic massif of the Miroč mountain plateau in NE Serbia, just downstream from the Danube Lower Gorge and 25 m above the present river level. The site was excavated in 2004-05 and 2008 as part of a collaborative project between the University of Cambridge and Belgrade University. The cave opening is oriented toward the west and within the 25 m long limestone cavity, sedimentary sequences reach depths >2 m and preserve stratified late Middle and early Upper Palaeolithic ('early Aurignacian') assemblages and abundant faunal remains. Sediment samples for microtephra analyses were systematically collected from exposed excavation profiles located c. 5 m and 11 m from the cave entrance. 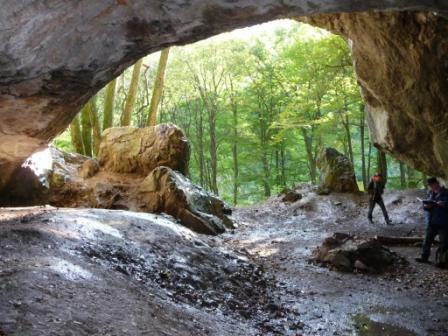 This trip to the Central Balkans also included visits to several late Middle and early Upper Palaeolithic cave and open-air sites in western Romania. 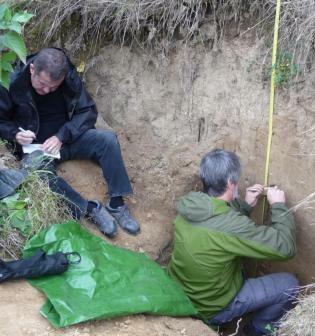 In late August 2010, WP-1 will return to selected sites to sample for distal microtephra as part of a joint German-Romanian research project investigating the chronology of the Middle/Upper Palaeolithic in Romania. (Below): Banat region of western Romania. View looking south from Coşava (Cuca) towards the open-air site of Româneşti (Dumbraviţa). Inset, nearby open-air site of Tincova (Selişte). Simon gave a well received, invited, keynote lecture on the opening day of the conference, outlining the importance of, and advanced applications of, Bayesian age modelling in chronology building. The application of Bayesian methods for both establishing eruption ages and incorporating tephra layer ages within depositional age models were presented, and illustrated with examples from the RESET project. Christine presented a poster introducing the RESET project and providing early results from WP-6. Results from tephro-stratigraphical work on the Lateglacial of lakes in Central and Southern Europe, currently in review, were also presented both within an oral and a poster presentation. A WP-6 contribution to the forthcoming special issue, in Quaternary International, is expected. Other RESET associated researchers from University of Oxford (Victoria Smith) and Royal Holloway University of London (Anna Bourne, Alison MacLeod) also gave good presentations on their own regional tephrostratigraphic studies. The conference lasted for one week, including two field days, visiting some of the active volcanic regions of Kyushu. In particular, the group were surprised by an eruption of Sakurajima volcano during the field visit to nearby lahar deposits (figure above)! 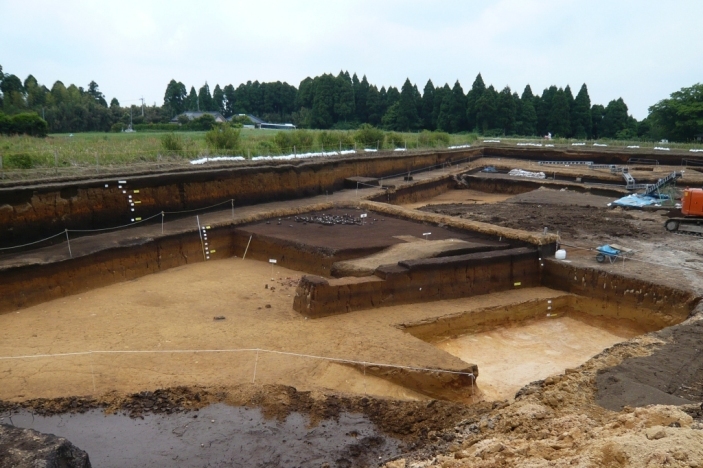 A visit to a reconstructed Jomon village and the ongoing excavations at the Tenjidan site (figure below) also added an insight into the local archaeological record and the relationships between the early inhabitants and the extremely active volcanic landscape. Christopher Satow attended the 2010 meeting of the EGU in Vienna, Austria where on the 5th May he presented a paper entitled The Absolute Dating Potential of Proximal-Distal Correlations in an Aegean Marine Stratigraphy (Core LC21) in the Advances in Quaternary Geochronology session. The paper was coauthored with J.J. Lowe, E. Rohling, S.P.E. Blockley, M. Menzies, K. Grant, V. Smith, and E. Tomlinson. See here for an abstract of the paper. Promising results from analysis of the microtephra samples from the 2009 samples taken at Węgliny (near Gubin) led us to revisit this former lake site in the southwest of Poland. 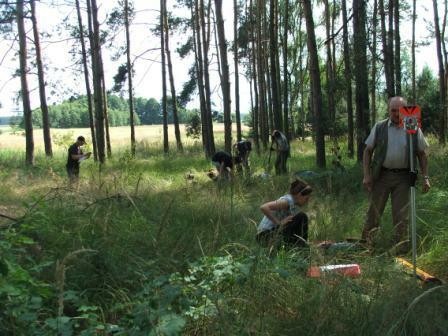 With the help of students from the Institute of Archaeology in the University of Wrocław led by Miroslaw Masojć, and Dorota Nalepka of the Polish Academy of Sciences, Kraków, we obtained two parallel core sequences covering 8 m of peat and gyttja. These will be worked on in the next few months furthering the analyses already made. The WP-2 team recently returned from another successful field season in North Africa, which included excavations and sampling at Grotte des Pigeons at Taforalt (Morocco) and Aïn El-Guettar (Tunisia). Research at Taforalt continues to focus on the collection and study of palaeoenvironmental and dating evidence relating to the Iberomaurusian (Upper Palaeolithic) and Aterian (Middle Palaeolithic) levels of the cave. 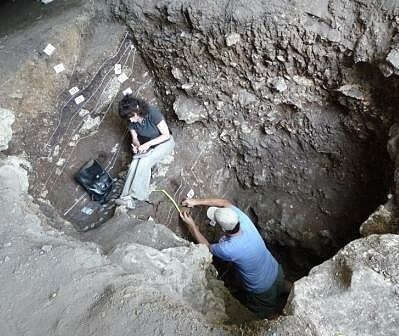 This season's excavations also included the completion of fieldwork for two PhD candidates. In addition, a new series of microtephra samples were collected from the Aterian levels of the site (figure, left). WP-2 also began a new research collaboration in central Tunisia with Dr Nabiha Aouadi-Abdeljaouad (National Museum of Raqqada, Kairouan) and colleagues. Recent excavations at the site of Aïn El-Guettar in the Meknassy Basin have uncovered evidence of several key phases of North African prehistory, including rich Mousterian assemblages and an underlying "Aterian-like" lithic industry, along with deeper archaeological deposits. 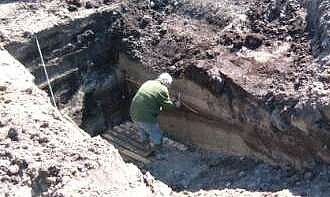 Microtephra samples were collected from the newly exposed stratigraphic sequence at the site (figure, right). During the developing Icelandic eruption in April 2010 I was on the slopes of Etna with Prof Mauro Cortelli (Istituto Nazionale di Geofisica e Vulcanologia) sampling at Biancavilla, Acireale and Garre searching for the Biancavilla ignimbrite flow and fall deposits produced during a uniquely explosive event on Etna 15,000 years ago. The deposit has been dated by 14C. Above the town of Biancavilla the deposit is a classic block and ash deposits probably from the collapse of an unstable spatter rampart system up on Etna. The ignimbrite contains large mafic clasts which are easy to collect in an ashy matrix. Fortunately the classic Biancavilla ignimbrite outcrop is in the back garden of a private house which means it will be preserved forever, unfortunately this means you cannot sample it. At Acireale and Garre the northward and eastward plumes from this unusual explosive event on Etna, deposited fall that was incredibly difficult to locate in the field. Many of the roadside stratified tephra deposits have been walled/cemented because because they were unstable and are now inaccessible. However Mauro and Deborah (INGV Catania) were determined and we located Biancavilla fall at two localities where a succession of the fall units were dug out and collected. Between April 12-16th WP-3 visited two Lateglacial kettle hole sites in eastern Denmark to take samples for microtephra analysis. The first site, Lundby Mose, is situated in southern Sjælland and is noted for its Pre-Boreal deposits of butchered elk bones, having been discovered in 1999 by students from the local agricultural school. In addition to the early Holocene elk bone concentrations, the site also preserves a promising Lateglacial sequence of deposits including what appears to be Allerød and Younger Dryas horizons. With assistance from Morten Fischer Mortensen and colleagues from the National Museum of Denmark and other Danish institutions, WP-3 was able to obtain cores from the site. The second kettle hole to be sampled was at Hasselø on the island of Falster. This site was found in the mid 1990s when two neighboring Federmesser-Bromme lithic concentrations were archaeologically investigated following discovery as a result of fieldwalking. 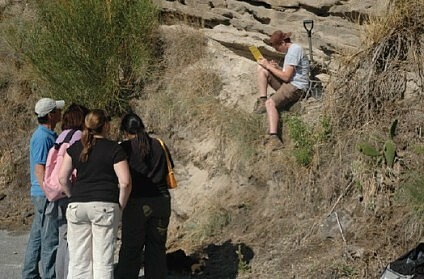 Little to no cultural material was obtained from the depression but a good Lateglacial sedimentary record was observed. 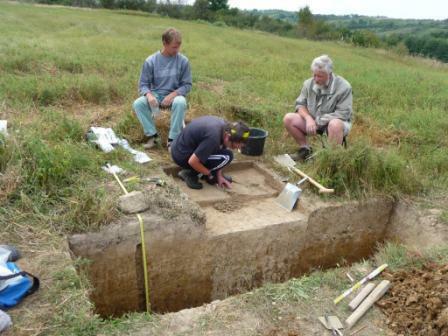 In 2010 with the aid of a mechanical digger a trench was opened and monolith tins were taken from the cleaned profile. It is hoped these two sites in south-east Denmark will provide positive information for the presence of distal Icelandic and Eifel tephras. Dustin White attended the 2010 OIS3 Conference in Brno, Czech Republic from March 15th-17th and presented a paper on: Microtephra and the Middle-Upper Palaeolithic "transition" in Europe, co-authored by D. White, C. Stringer, V. Cullen, C. Lane & M. Lewis. The conference also provided the opportunity to meet with several new RESET colleagues from central and eastern Europe to discuss WP-1 sampling plans scheduled for the 2010 field season. Between 12-14 January Rupert Housley (Geography, RHUL) and Cassian Bramham-Law (DPhil student, Oxford University) visited the Institut für Geobotanik at Leibniz Universität, Hanover to take cores and tins from off-site organic sequences in close proximity to the archaeological sites of Weitsche 2 and Oldendorf. These sites had previously been visited by RESET in August 2008 when on-site sampling was undertaken. Whilst in Hanover the RESET personnel were ably assisted by Falko Turner. WP-3 is particularly focusing on the relationship between the presence or absence of microtephra in dryland vs. wetland localities that are situated in close proximity to one another. The two sites listed here are particularly well suited to such a study and will form part of the doctoral research of Cassian Bramham-Law. Anna Todman and Paul Albert attended the 44th annual conference of the Volcanic and Magmatic Studies Group (VMSG). VMSG is a joint specialist group of both the Geological Society of London and the Mineralogical Society. The conference was held at the University of Glasgow between 4th - 6th January, 2010. At the meeting Paul presented his work on Continental-marine tephra correlations: Aeolian Islands, southern Italy; whilst Anna presented her work on Vulcano, Italy: the geochemistry of effusive and explosive activity in space and time.